It might have taken three days but yesterday finally saw this year's PaddyPowerPoker.com Irish Winter Festival trophy fly in the direction of one lucky player. Having started out three days ago with 341 hopefuls the tournament came skidding to a conclusion last night after Slovenia's Rok Rotar carved his way through the final 17 players. Having already made his way past some of Ireland's finest, including Andy Black and former WSOP champion Noel Furlong, Rotar was able to enjoy a stint amongst the chip leaders in the early offing. However, a few slips over the course of Days 2 and 3 almost saw swap his chips for pints of Guinness. Any moments of fear were soon forgotten though as Rotar soon got into his stride as the final table approached. With an average chip stack behind him he gradually moved to within striking distance and, after watching the likes of Jimmy Wan, Bartosz Ciesla and Mathias Puzich, fall by the wayside he shot for the chip lead. Indeed, with just four players left he held half the chips in play and by the time he'd dispatched with former chip leader Paul Kristoffersson the tournament was his for the taking. Now heads-up against Samuel Welbourne with a 4:1 advantage it didn't take long for Rotar to snap call his opponent's all-in move. After raising Welbourne pre-flop, Rotar called the all-in reply with Ad 4c and found himself marginally ahead of his opponent's Qs 8d. Needing the board to throw him a lifeline it was Welbourne praying for some help, but as the cards rolled out: 3d 7s Td Js 2d the final pot and the trophy were pushed towards Rotar. 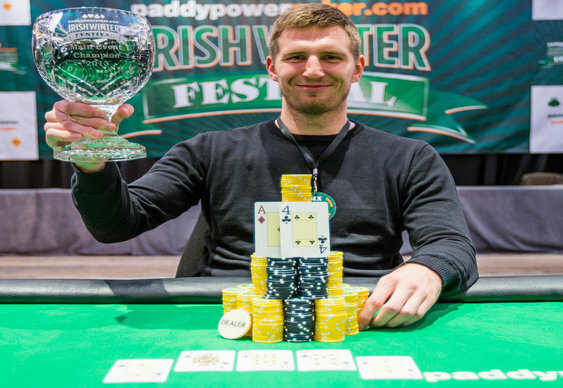 As the Slovenian sports bettor posed for pictures with his first trophy and cheque for €85,000, he was also told that he'd won a seat in next year's Irish Poker Open courtesy of PaddyPowerPoker's Six Survivor promotion. Image courtesy of Danny Maxwell at the Paddy Power Poker blog.